The U.S. Energy Information Administration says goals to blend 36 billion gallons of biofuel by 2022 won't likely be met. The EIA also lowers projected greenhouse gas emissions thanks to renewable energy and conservation. The United States will not be able to meet the mandate to use 36 billion gallons of biofuels by 2022, reported the U.S. Energy Information Administration Wednesday. The country could meet that goal by 2030, with most of the biofuels coming from corn-based ethanol, the EIA said in its preliminary annual report. The report looks at the country's generation and use of energy, from electricity to transportation fuels from 2007 to 2030 (see EIA charts). The EIA issued the report on the same day when President-elect Barack Obama named former Iowa Gov. Tom Vilsack to the agriculture secretary post. Vilsack is a big biofuel proponent. Congress passed the mandate last year to promote biofuel use, an attempt to reduce the country's dependence on foreign oil. The legislation in effect created a huge market, and it specifically requires the increased use of certain types of biofuels, including cellulosic ethanol. Although the mandate prompted a rush of private equity investments into biofuels, filling the government quotas won't be so easy after all. The EIA predicts that the biofuel industry will be able to produce roughly 30 billion gallons, not 36 billion, by 2022. The EIA projections confirm what some in the private industry have been saying. A recent survey by investment firm ThinkEquity shows that cellulosic ethanol makers will likely miss federal targets by a weighty margin, at least in the near future. Instead of meeting the goals to produce 100 million gallons of cellulosic ethanol in the United States by 2010, the survey indicated that only 28.5 million gallons will be available in 2010 (see Consumers to Pick Up Tab for Off-Target Cellulosic Ethanol Industry). The survey suggests that a dramatic growth in cellulosic ethanol production will happen by 2011. If that happens, it will require producers to line up financing and build refineries according to plans. The industry could then produce 247.6 million gallons to met the 250 million goal for 2011. Since 2030 is a long ways off, the EIA could revise its forecast in the next few years if biofuel producers are able to boost production quickly. Unlike corn-based ethanol, cellulosic ethanol comes from plants that are not used for food. That's a promising premise, given the fierce debate over whether the growth in corn ethanol has contributed to rising food prices worldwide. But the cellulosic ethanol industry is still in its infancy. Many companies are still perfecting their chemical processes to turn wood chips and grasses into fuels. ThinkEquity's David Woodburn estimates that the industry will only have about 6.3 million gallons of production capacity by the end of this year. Meanwhile, refuel retailers and consumers will have to pay the government to cover the shortfall. It turns out that the federal mandate requires gasoline retailers to buy credits from the U.S. Environmental Protection Agency if they aren't able to blend a certain percentage of biofuels. Retailers, in turn, can be expected to pass on the costs to consumers. The energy per dollar of the gross domestic product is declining, and so is the per capita energy use. Crude oil prices have been taking a dive lately, but they could reach $130 per barrel by 2030 (in 2007 dollars). Despite efforts to use more renewable energy, from electricity to transportation fuels, fossil fuels still will provide 79 percent of the total energy in 2030. The nation's appetite for electricity will continue to grow, but at a slower pace than previously thought. Renewable energy policies and better technologies to conserve power use are making a difference. 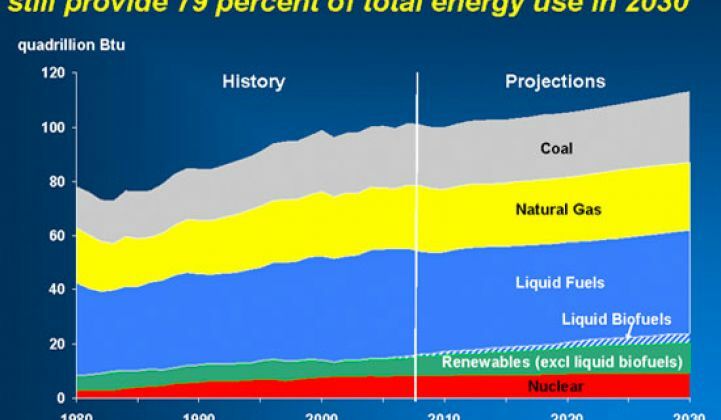 The electricity consumption grew 1.1 percent annually between 2000 and 2007. It's expected to grow 1 percent annual growth between 2007 and 2030. Natural gas and renewable sources such as biomass, solar and wind could represent the largest growth in electricity generation. The agency expects that the power generated by natural gas-fired plants will add 139 gigawatts to the nation's power mix between 2007 and 2030. 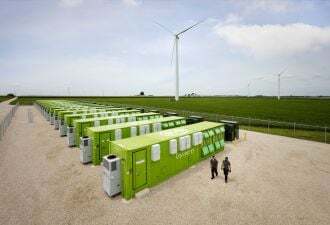 Renewables could add 57 gigawatts. Coal will still be a big player, adding 46 gigawatts. Nuclear could contribute 13 gigawatts. By using more renewable energy and use energy more efficiently overall, the United States will generate 9.4 percent less greenhouse gas emissions by 2030 than what the EIA predicted last year. The EIA revised the forecast for 2030 from 6.851 billion metric tons to $6.4 billion metric tons. Energy-related emissions are expected to increase 0.3 percent per year and could decline with new policies to cut emissions.